The Ankeny Congregation hosted a special guest at Love Feast on Thursday night. Right before the service started, Iowa opera legend Simon Estes and his wife Ovida along with two of Ovida’s sisters, a brother-in-law and a niece unexpectedly entered the church basement. They took part in the traditional meal and footwashing, then at the request of member Vernon Merkey, Simon graciously agreed to sing “Precious Lord” as we all sat there transfixed. Never before, at least at an Ankeny Love Feast, has applause been heard before! Simon’s wife Ovida (Stong) attended the Stover Church many years ago and attended Camp Pine Lake at the same time as Rhonda (Reynolds) Bingman. They enjoyed some time catching up. 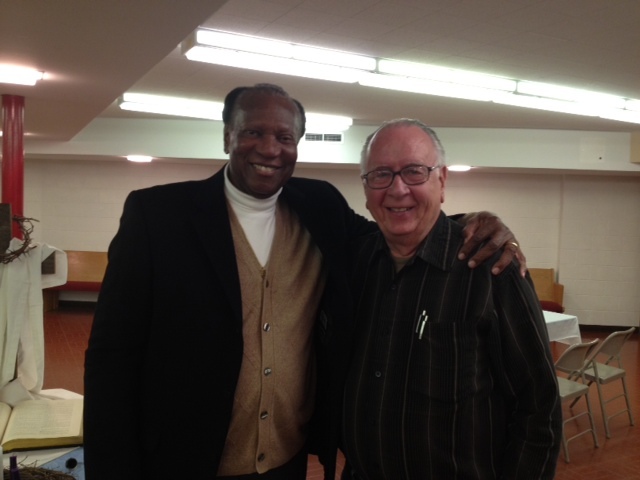 Pictured is Simon Estes along with Ankeny Interim Pastor Dan Sanford. Unless you attend Love Feast, you just never know what you might miss! Click here to read the April 2012 edition of District News and Announcements. Click here to view distances to congregations in the Northern Plains District. Click here to view the March 10 edition of District News and Announcements. Click here to read the latest District News and Announcements. Camp Pine Lake, Northern Plains District of the Church of the Brethren, Eldora, Iowa, seeks four energetic, hard working, nature-loving people to join the 2012 summer staff. Applicants must be flexible, willing to work as a team, love children and have a deep desire to share God’s love. Summer staff will live and work at Camp Pine Lake from June 1, 2012 through August 15, 2012. Summer staff will serve in all capacities on a rotation of property, kitchen and programming preparation work during outside rentals and as full-time counselors during all Church of the Brethren camps. Applicants must be 19 years of age and out of high school with one year of college or the equivalent. Some counseling experience and/or work with children is preferred, as well as previous involvement in organized church activities. A formal training weekend or retreat will be required, as well as participation in summer long team building and Bible study meetings. Compensation is $1,500 to be paid in monthly stipends or directly to an educational institution in the form of a scholarship. Room and board is provided at the camp. Some time off will be given. Contact Camp Pine Lake for more information: camppinelake@heartofiowa.net or 641-939-5334 or bwlewczak@netins.net or 515-240-0060. Application materials include the application form, essay worksheet and two letters of reference – one character and one professional. Each applicant will be interviewed by current camp staff. Each staff member will go through a complete background check. Click here to view photos and profiles of the 2012 Camp Pine Lake Board. Click here to view this month’s District News and Announcements. Prayer calendars for each congregation are now available by clicking the links below. As part of our effort to expand the District prayer ministry, we have included links in the prayer calendars that provide specific information about each congregation. Congregations that have already called a Communications Partner are now able to update these pages. Those congregations that haven’t called a Communications Partner yet, please consider that the sooner you find one, the sooner we can get this expanded prayer ministry rolling. We are excited about the prospects of this new dimension to our prayer ministry, and hope you find it beneficial as you continue to pray for each other each week. For more information about becoming a Communications Partner for your congregation, please email Jess Hoffert at nplainscom@gmail.com. We don't have any events scheduled at the moment. The Northern Plains District relies on your generous support to continue its support of vital ministries at our 32 congregations, fellowships, and church plant projects. If you feel called to give, you may do so at the link below.